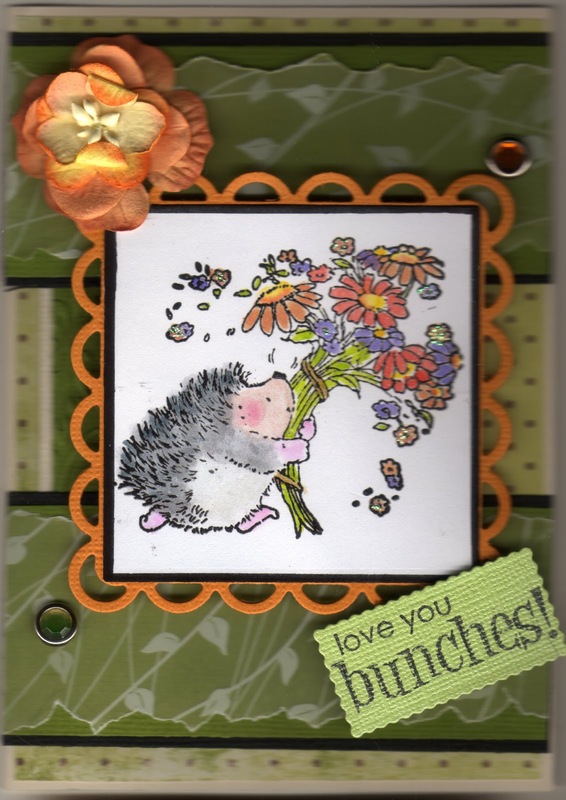 Whew I finally managed to squeeze in some me time to make this card for the Penny Black at Allsorts blog were the challenge is to Say it with Flowers. I've had this clear set for awhile and don't know why I don't use it more often, it's fiddly with the small flowers but all part of the challenge of cardmaking . Sentiment is also Penny Black of course! 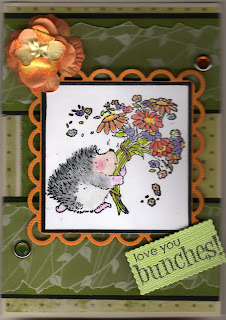 I also entered a similar card except done with purples in the Penny Black readers blog challenge. What a lovely card Cynthia! Love the green and orange colours you used, they are perfect together. And you did well with colouring the flowers, they are beautiful. Gorgeous colour combo, love those papers and the cute image is coloured so beautifully! You have made a fantastic job of your card Cynthia, it is gorgeous. Just perfect for our challenge this month at Penny Black at Allsorts. thank you for sharing your lovely card with us and we hope you will join us for our March challenge. Such a beautiful card! Love the colorful bouquet. Thanks so much for playing along with us at penny black at all sorts! Beautiful colours and layout alongside your cute image. You have coloured it so well. Love those torn edges too!! p.s. Love the font you use on your blog. Gorgeous card and beautifully coloured love the torn vellum,thanks for joining us at Penny Black at Allsorts.